Many smoothies are made with gobs of added sweeteners. This cool and refreshing sipper uses the natural sweetness of dates, which also adds a healthy dose of tummy pleasing fiber. Walnuts are the secret ingredient, adding texture, flavor, and ALA omega-3 fats. These important fats help promote heart health and fight inflammation. Make this smoothie for breakfast or for an after dinner sweet treat. With an impressive five grams of fiber per serving, you can satisfy hunger and a sweet tooth in a healthy way. 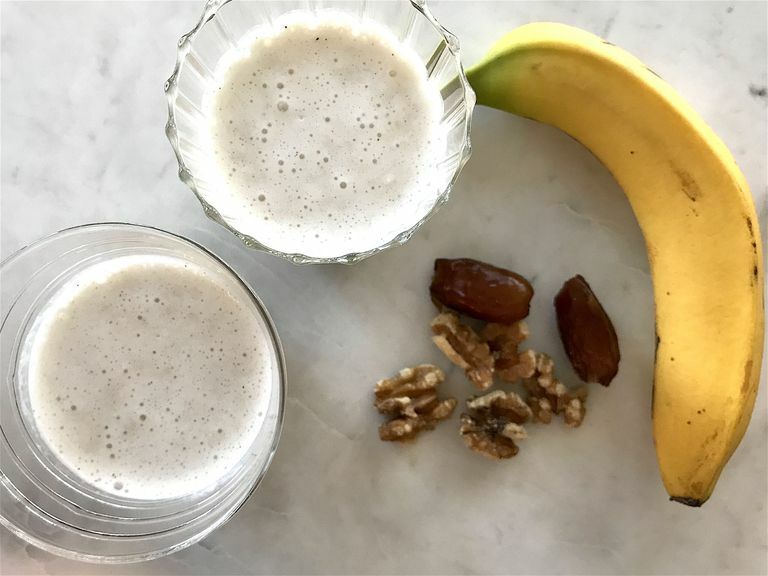 Combine banana, dates, walnuts, milk, and ice in a blender and blend until smooth. Make this recipe vegan and dairy-free by using soy or another dairy alternative in place of milk. Instead of using bananas, make this same recipe with other healthy fruits such as mango, strawberries, or wild blueberries. Prep the ingredients ahead of time and toss in the blender for a quick and easy breakfast or afternoon pick me up. Trying to get better at making smoothies? Here's a good place to start: If you find that your blender gets stuck while blending, try adding the liquid before the solid ingredients. You can also add a few splashes of water to thin out the mixture. This will help adjust consistency without adding any additional calories. Don't waste the leftovers! Pour remaining amounts into popsicle molds and freeze for a naturally sweetened ice pop treat.